A community blog of current events, touching stories, and news about Center on Halsted and the lesbian, gay, bisexual, trangender, and queer community in Chicagoland. Bloggers include Center on Halsted staff, volunteers and special contributions from members of the community. Hopefully you got all motivated to try out new recreation and fitness programs from last blog post. I think I saw some new faces at Queer Yoga! This week, I wanted to write to you about the amazing arts programming we have going on at Center on Halsted. 20 Neighborhoods has been working on a collaborative art piece throughout four sessions. This project, led by Women Made Gallery, brings together women from across Chicago, who are affiliated with various organizations, to create a collaborative art piece. This piece will represent self, family, and community. 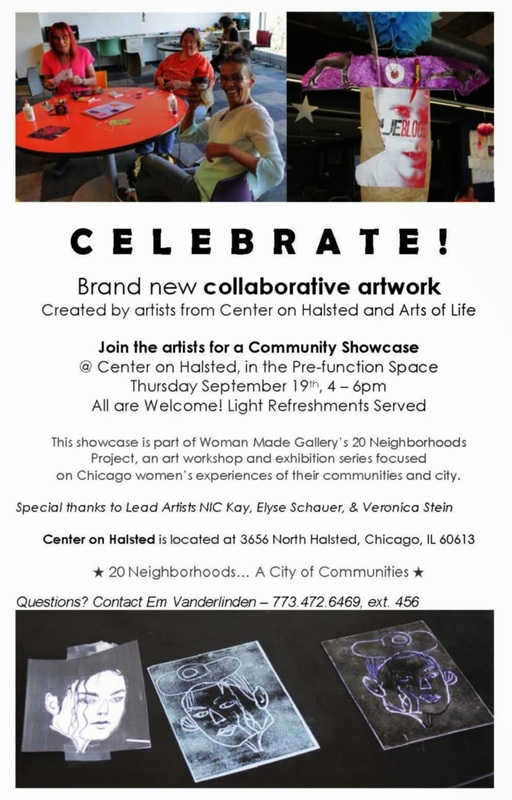 You can check it out at the exhibition at Center on Halsted on September 19th and at Women Made Gallery later in October. Look for the details here http://womanmade.org/index.html and on our calendar. If you’re on the meetup scene, you might be familiar with Sapphic Adventures. If not, I recommend it. They host a Women’s Painting Series here. I participated in the last one, and I have a painting-formerly-known-as-a-Kandinsky hanging on my wall. The next class is in November. Look forward to a registration page to save your spot. Gotta get those prime easels! Love visual arts, but hate getting your hands dirty? Do I have the event for you! Every six weeks, we change the galleries on our second and third floor. And, each new show is cause for a party! Join the artists themselves in a gallery opening. Sometimes, there’s snacks. Often, there’s a cash bar. Always, there’s great artwork. Keep your eyes open for some film screenings coming your way in the late fall and winter. These are in the works, but if you have a great film on your mind that you would love to see, let me know. You can reach me at evanderlinden@centeronhalsted.org, or my extension is 456. I’m still working on the carrier pigeon training. I hope your inner artist is brimming with the possibilities offered at Center on Halsted! I’ll be seeing you soon, paintbrush in hand. My name is Brian and I am one of the mental health interns here at Center on Halsted. I will be posting blogs related to mental health over the next year. Today I am excited to share some information about our new groups that will be starting in September!!! To those that haven’t been in group therapy it might seem overwhelming or strange to participate in group therapy, but if you give it a chance you might enjoy it! Participation in the group is always voluntary and even on days where you want to be a silent member you might benefit from just being there. It is always your choice how much and what you want the group to know about yourself. Just remember the more you become involved, the more likely you will benefit from being in group therapy. Group therapy might be an affordable option to enrich your life. You might find that you have important things in common with other members. You might hear something that strikes a chord which then allows you to address an issue you were not previously aware of. Maybe being part of a group will allow you to identify more honestly and directly with other people in your life. Here at Center on Halsted we offer a variety of groups that may fit your needs. So I invite you to check out our Mental Health Support Groups and if you see something that you might be interested in contact us! © 2013 Center on Halsted. Simple theme. Powered by Blogger.